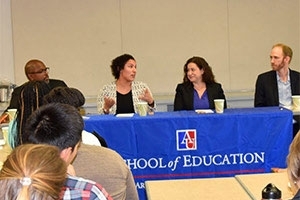 The Education Policy and Leadership (EPL) program in AU’s School of Education (SOE) hosted a policy and leadership career panel on May 24, 2016. Students, alumni, and faculty gathered to hear panelists speak about the education field and their experiences helping to improve K-12 education. Moderated by SOE instructor Melissa Turner, the four panelists, Gloria Molina-Estolano, Cosby Hunt, Gloria Molina-Estolano, Cat Peretti, and Scott Sargrad, discussed their diverse perspectives on both classroom and education-reform issues. Gloria Molina-Estolano, an AU EPL alumna, is the Manager of Government Affairs at Teach for America. She previously taught Spanish in DC for three years as a TFA corps member. Cosby Hunt is the Senior Manager for Social Studies Education at the Center for Inspired Teaching. He co-founded the Inspired Teaching’s Building Literacy in the Social Studies program, was awarded DC’s 2008 History Teacher of the Year, and created DC’s first citywide, credit-bearing high school history course, Real World History. Cat Peretti is an attorney with experience in education policy at the federal, state, and local levels. She currently works as the Executive Director of My School DC and was previously the Policy Director at E.L. Haynes Public Charter School. Scott Sargrad is Managing Director of the K-12 Education Policy team at the Center for American Progress. He primarily focuses on standards, assessments, school and district accountability systems, and school improvement. Sargrad previously served as the Deputy Assistant Secretary for Policy and Strategic Initiatives in the Office of Elementary and Secondary Education at the U.S. Department of Education. A huge thanks to Melissa Turner who planned and organized the event and to the School of Education for their support and assistance.